Over the last decade, the use of laparoscopy by urologists has grown exponentially. From its initial use in pelvic lymph node dissections to contemporary use in radical prostatectomies, laparoscopy is quickly becoming a staple in the armament of modern urologic surgery. Because of its technical challenge and steep learning curve, however, laparoscopy tends to be limited to younger, fellowship-trained surgeons. In addition, standard laparoscopic techniques even in the most skilled hands are not routinely used for removal of kidneys with large tumors. 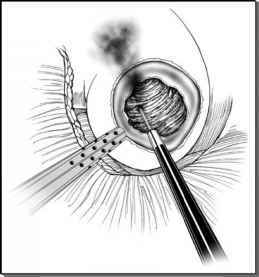 Hand-assisted laparoscopic nephrectomy was introduced in 1996 when Bannenberg et al. (1) performed the first nephrectomy in the pig. They reported that the hand-assisted laparoscopic nephrectomy technique was quick and easy to perform, and compared with conventional laparoscopic nephrectomy, operative times were shorter (30-45 vs. 90-120 minutes). In 1997, Nakada and colleagues (2) reported the first handassisted laparoscopic nephrectomy in a human for removal of a chronically infected kidney from stone disease. Since 1997, numerous publications have reported the use of hand-assisted techniques for radical nephrectomies, nephroureterectomies, donor nephrectomies, partial nephrectomies, and dismembered pyeloplasties (3-7). Since 1998, we have performed over 500 hand-assisted laparoscopic renal procedures using hand-assisted techniques. Hand-assisted laparoscopic offers a minimally invasive technique, which is easy to learn even for the nonlaparoscopic surgeon. This technique has given hundreds of community-based urologists the ability to offer their patients a minimally invasive alternative to standard extirpative techniques. Hand-assisted techniques utilize all the principles of standard laparoscopy but offer the surgeons the advantage of using their most versatile instrument available: their hand. The hand aids in dissection, exposure, retraction, and maintaining hemo-stasis. The hand may also assist in more advanced techniques such as intracorporeal suturing and knot tying. Furthermore, by maintaining tactile sensation, the surgeon is able to palpate vessels and organs that may not be discerned by visualization alone, thereby potentially minimizing the risk of injury to vital structures, particularly during difficult dissections. In essence, hand-assisted laparoscopic combines the advantages of laparoscopic and open surgery (8). Pure laparoscopic nephrectomy has inherent limitations. When operating on large, bulky tumors, it may be difficult to adhere to principles of oncologic surgery using standard laparoscopic techniques. In addition, removal of an intact specimen requires an incision usually as large, or larger, than a "hand-access" incision. Hand assistance helps the urologist maintain standard principles of oncologic surgery while employing a minimally invasive approach. In addition, the operative time can usually be shortened as compared to pure laparoscopic surgical techniques. Finally, if an incision is going to be utilized to remove the intact kidney, there is a clear benefit in making this incision early on in the procedure and using the hand to facilitate the entire procedure. The most favorable patients, especially during the initial learning phase, include those who are relatively thin, have unviolated abdominal cavities, and have small lower pole tumors located away from the renal hilum.